WAHINE VOLLEYBALL » Hawaii seniors Susie Boogaard, Victoria Prince and Ashley Watanabe were honored after last night's match at the Stan Sheriff Center. The Kauai teen's drive to compete amazes many at a North Shore surf meet. A Nuuanu church will host a service that has been held for 44 years. 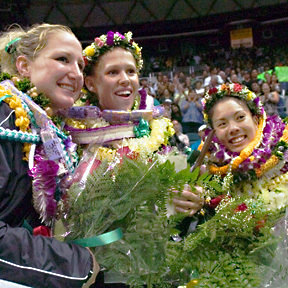 The Rainbow Wahine celebrate senior night with an easy victory over Louisiana Tech. A tycoon's heirs say Seibu is moving to sell local hotels against their will. The House has OK'd $38 million in grants to preserve World War II detention sites.